This undated NASA handout image shows a full scale James webb Space Telescope. After a series of delays and billions spent over budget, the potent James Webb Space Telescope is on track to launch in 2018 at a total project cost of $8.8 billion, NASA vowed on Tuesday. After a series of delays and billions spent over budget, the potent James Webb Space Telescope is on track to launch in 2018 at a total project cost of $8.8 billion, NASA vowed on Tuesday. The project, which aims to build the world's most powerful telescope, 100 times more sensitive than the Hubble space telescope, has been riddled by poor management and cost overruns. Though a Congressional subcommittee threatened to ax the project altogether earlier this year as lawmakers grappled with how to reduce a more than $15 trillion national deficit, Congress has since agreed to fully fund it at the level NASA requested. But NASA's new JWST program manager Rick Howard who came on board last year, still faced an acrimonious grilling on Tuesday from lawmakers in the House Committee on Science, Space and Technology. Committee chair Ralph Hall described the project as "another case study of NASA mismanagement" and said the NASA reshuffle was "the agency's last opportunity to hold this program together." "We have changed the management, the priority and the approach," Howard told the committee hearing. "We can deliver JWST within costs." In February, NASA inspector general Paul Martin told lawmakers that the telescope had gone way over its initial budget of $3.5 billion and was likely to come in at around $6.5 billion. NASA has also pushed back its scheduled launch -- initially set for 2013 -- numerous times. It is now set for October 2018. 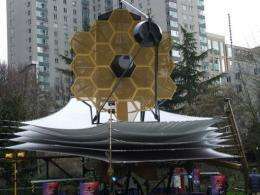 Garth Illingworth, an astronomer and professor at University of California, Santa Cruz, was part of an independent comprehensive review panel (ICRP) that reviewed NASA's work on the JWST and issued a report last year. "I feel that NASA has actually done a very good job on this replan. They have developed a plan that is I would say uniquely conservative for NASA in the level of reserves and the approach that they are taking," Illingworth told lawmakers. "They realized that they had seriously flawed management before the time of the ICRP and are trying to rectify it, as Rick said," he added. "I am highly encouraged by what I have seen over the last six to nine months on this program." Republican lawmaker James Sensenbrenner asked how the US space agency would carry out any repairs on the telescope, recalling how the orbiting Hubble needed numerous service missions by the space shuttle program, which retired this year. "We don't have the shuttle anymore. What is going to happen if we need to repair the James Webb Space Telescope or if we find out some the parts were not properly done?" he asked. Howard responded that NASA was already in the process of testing and checking the mirrors at operating temperature, and noted that the telescope's path would take it beyond where the world's spacecraft have the capacity to carry humans, anyway. "We know that we only have one chance to get this right," Howard said. "It is not going to be in orbit around the Earth, it is going to a distance four times further away than the moon. So we are taking every step we can to mitigate the risks to make sure that we do have a system that can work." "You've just increased my skepticism given the history, and I have been on this committee longer than anybody else," Sensenbrenner answered. "I can see another money pit coming up." Money pit indeed. Maybe if NASA was more privatized it would conduct its business more sensibly and economically rather than more expensively and politically. For example, maybe if they spent half of that 8.8 billion dollars on researching more cost effective means of getting into space and traveling in space(Space X)rather than pushing expensive status quo missions for the public optics, than maybe JWST mission and future missions wouldn't cost as much. NASA is just another loaded down bureaucracy which doesn't have the concept of efficiency at the top of it's priorities for the long run. JWST is the remnant of rich era before fossil fuel and financial crisis - now it kills the less adventuresome, but more effective projects. Final date, almost 2019....and it could(should) be operational in 2013, no comment... in 2019 technology will be so advanced, that this telescope won't be so impresive as it could be in 2013. Yes ScienceFreak86; but, well, that's the way these things go. The initial effort is more expensive than the next; but, without going through that initial expensive phase, we might not get to be able to do it more efficiently later. How does one accomplish that anyway? If you paid 100 people an $80,000 salary, then that's only $8 million per year. If it was literally made out of pure gold and rare earths, the materials would only cost about $40 million. Presumably almost the entire cost is in the construction and maintenance of the clean rooms and cryogenics for testing?!? In reference to your reply to CapitalismFails, thanks, you said everything I wanted to say, and more. Better to have cost overruns with space exploration than military equipment. The James Webb telescope is going to be amazing. For those complaining about monetary issues, NASA is already underfunded to the max. IT seems like you don't want to advance our knowledge of the cosmos? IT seems like you don't want to advance our knowledge of the cosmos? LOL, cosmologists aren't interested about knowledge of IT about cosmos anyway...;-) The dense aether model would render them useless. If anyone actually benefited from anything in space exploration, nobody would complain about the costs. "yawn. That's pretty neat, but so what?" And about the only thing you got out of it was a wallpaper for somebody's desk top. No offense, but Hubble didn't help make a better computer, and it didn't advance medicine. Hell, it hasn't even really advanced theoretical physics or particle physics, at least not in any PRACTICAL sense. We haven't had any new materials or technology discoveries based on any new science discovered by Hubble, etc. Ultimately, all it did was make some pretty false color pictures. "This undated NASA handout image shows a full scale James webb Space Telescope. " Hard to tell from the small image, but it appears that they've got the JW sitting outside a retirement community so people could get up and person with it. lmao. Maybe the author meant the caption to say "James Webb "mock up"..."
What really blows my mind is this crap just goes on and on. Does anyone really think it's not possible to accurately estimate the costs of something along these lines? Sure, there are occasionally unforeseen circumstances. However, this doubling of budgets garbage happens at NASA and other bloated agencies....nearly every time! And by comparison, the biggest revolutions in materials science in modern times appears to be graphene and carbon nanotubes, and that was discovered by accident by a guy playing around with a few cents worth of pencil lead and scotch tape. Assuming the JW doesn't get destroyed by some rocket failure, or some other catastrophic failure, what do you expect it to find? A new class of galaxy, or an "older" galaxy allegedly a half billion years farther away? Maybe something else we haven't thought of? What difference will it make? Probably none. It won't help solve the economic crisis, or feed the hugry or clothe the poor, that's for sure. It would have to make a discoverty directly leading to unifying laws of physics, or discover unobtanium in order to pay for itself in any practical way, which is highly unlikely. A few more false color pictures to add to our already useless collection, that nobody even has the time or will to look at. That about sums it up. 1) Did anyone see the Hubble article re: 10,000 scientific papers published? JW represents a similar opportunity to advance basic research. So, despite the political and financial garbage, we need to focus on the potential future value of this mission. 2) To CapitalismPrevails point, it's true that this type of ridiculousness rarely occurs in the private sector. The further away people get from the source of their funding, the easier it is to forget that it's actually someone's real hard-earned dollars you're playing with. I expect, like everything else, the government has their hand in the cookie jar on this. Which is why it's taking so long to get this telescope off the ground. Do we really need another expensive telescope to tell us what we already know? To tell us that, there may be habitable planets out there that we just don't have the technology to get to? Or that there are comets out there that pass close to our planet; as they have for billions of years? I'm sure the hubble can see alien craft just as easily, if they are out there. Do we really need to spend $8.8 billion so that the rich folks can have another expensive "toy" to play with? If you are a single homeless person, it's hard enough to meet the basics to stay alive, just one more day. Think about a homeless family with small children. It's easy to sit in your warm homes and say "get a job"; It's not so easy to get one. No matter how much the politicians want to put the message out there that jobs are abundant, the fact remains; there are not enough jobs for every one. This country takes pride in saying it's one of the world leaders. It's a shame that it would rather spend $8.8 billion on another rich mans toy than, feed, clothe and, house it's own people. That it would rather see them freeze and, starve in the streets. I feel that they have no right to spend that, or any, tax payer money to buy toys for the rich. Not until every man, woman and, child, in this country is safe and warm, in a home. Maybe part could be spend on re-training so, they can get jobs. I'm totally disgusted by the way rich politicians, in this country, use the tax payer money to buy their toys and then, let people live and, starve in the streets. yeah, we got serious social and moral issues in this country. There is no jobs because of automation and other advances in technology. More and more products are producted by robots and other highly automated systems, leaving little demand for human works of any skill level. The jobs are by and large never coming back, which means unemployment is always going to be about this bad or worse, give or take a few points. This represents what will be a revolution in the whole concept of what income and wealth are. Replace enough people with automated systems and then currency will fail totally. Any concept of capitalism will fail totally. Why? Because if you don't have employees then people don't have money to buy the products made by the robotic factories that all the filthy rich people will own. So then the rich people will have no customers. The 8.8 billion dollars is not going to be converted to bearer bonds and blasted into space- every penny will be spent in the US economy and used to create jobs and research opportunities. Granted it is being spent by the government but it's going to end up with US companies and ultimately US citizens, so don't feel too bad about it. It's really a shame they let the Red Chinese agents comment here down grading this project that will clearly improve technology by leaps and bounds in the future. Is the only thing they can complain about is how much money it costs? How pathetic, I get tired of listening to the programmed response these enemy agents are spewing. Oh wow it all makes sense now mfritz0. Pirouette actually is a Red Chinese disinformation agent trying to get Americans to take up conservatism so they implode and leave the world to the Chinese. If I were insane that's what I would believe. But if you think like that you are a waste of life IMO. what a lot of people overlook wuth a project like this is it pushes the boundaries of science. when you do that you come up against unforseen issues and invent ways to overcome them, so as the budget grows so does the payback in the new developments. If we knew axactly how to do everything and how much it would cost before we started then we wouldn't learn anything during the development process. So it is not wasted money, but like many things in the space program it's difficult to quantify exactly where the paybacks are. At the end of the day it's not a project consuming vast natural resources, and the engineers working on it have to be paid to do something, so it's better to pay them to work on this, developing new technology for the benfit of us all and keep the money circulating in the economy, than make them redundant and sitting at home claiming benefits. Many commentaries above show little or no knowledge of project management and budgeting. In projects that involve research and invention, budgeting is always a bit of a gamble. In fact, there are project methodologies that take this into account and try to work around the inconveniences. Look up SCRUM. This is a methodology that specifies a project deadline, but does not promise to deliver everything required on time. It only says that the most important bits will be delivered on time but not necessarily all of the less important ones. That is, because it is acknowledged that such projects tend to spill over their deadlines and budgets. It's a known fact in the several (if not all) industries that have to do with research. What's to stop some small space debris from wreaking havoc on the mirrored segments? What is sickening about this entire project is that it has been, as have the majority of NASA projects, conceived and executed by people that have no regard for the needs of the American Citizens whose health and well being has declined in recent years whilst NASA see fit to go back to the fruit bowl for more. Let us see all Americans go the government with a bright idea and get unjustified amounts of funding to enable their projects. This is a case of national pride and the conceit of the scientific community overtaking rational and reasonable policy making. No wonder Sensenbrenner was despairing of it all. I've only one advice for Americans: just invest into cold fusion, remove this silly dependency on the East Asia oil and you'll get lotta money for adventurous projects like the JWST or Apollo again. I'd stop the JWST project already being at their place, but the whining will not help anybody by now. Press your local politicians to the accelerated implementation of cold fusion - whole the financial crisis comes just from fossil fuel price crisis (and expensive fossil fuel wars maintained with fossil fuel lobby) - nothing else.